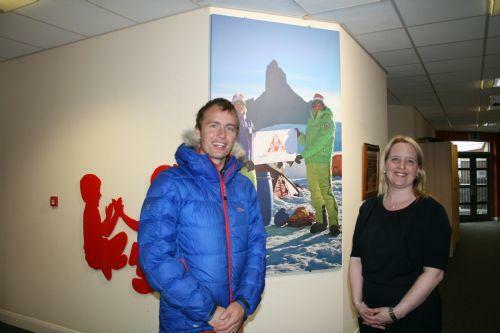 Following the month long year 6 context for learning on Antarctica and their own expedition to the ALPS, the world class climber Leo Houlding visited the school. 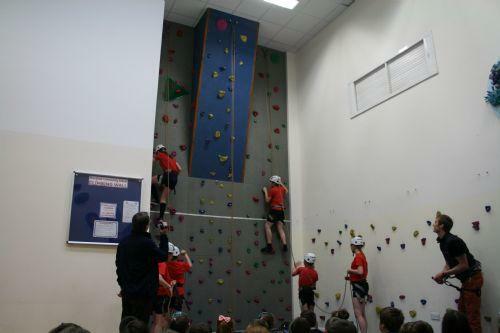 Leo's expedition to climb the unclimbed North East Ridge of Ulvatanna in Antarctica was the inspiration for the Year 6 learning expedition. 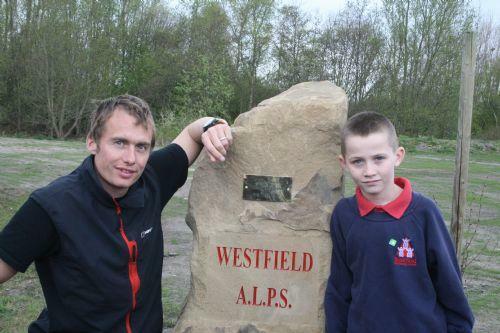 On Friday 3rd May the school's ALPS (Adventure Learning progress Space) was officially opened by Leo, witnessed by two children representing from pre-school to year 6. 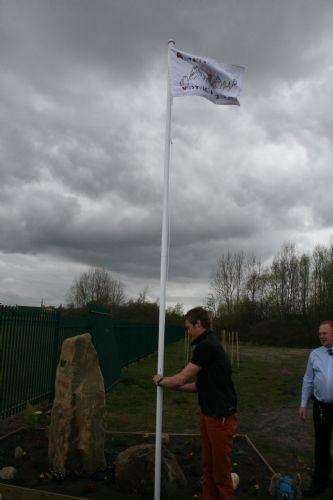 A plaque on a large sandstone boulder was unveiled and followed by a flag being raised. This is an exact copy of the flag that Leo and his team took to Antarctica for us. A picture of the flag in Antarctica now hangs on the wall at the entrance to the middle phase. Leo was accompanied by professor David Hopkins (Executive Director of the Adventure Learning Schools) and Steven Howe (Deputy Director of ALS). 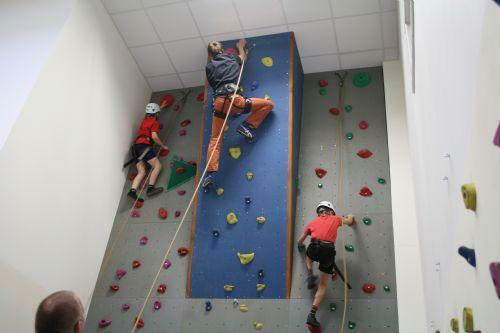 After the opening of the ALPS, the visitors went to the small hall where six year 6 climbers (who are working towards achieving their level 3 NICAS award) joined Leo on the climbing wall watching our talented pupils climb, plus after re-enforcing all safety aspects of climbing, Leo agreed to race against two of the children (Kyle and Brad). It was a superb and incredibly fast race. Kyle was unfortunately beaten by Leo, but only by a fingertip!! Brad finished a fraction behind. After climbing, Leo delivered a spectacular and inspirational presentation to years 2 to 6, guests and staff on his love for adventure, preparation and execution of his adventure to Ulvetanna. Finally, year 6 proudly showed a short documentary that they had made during their expedition to the ALPS as well as selected pieces of work whilst learning about Antarctica. 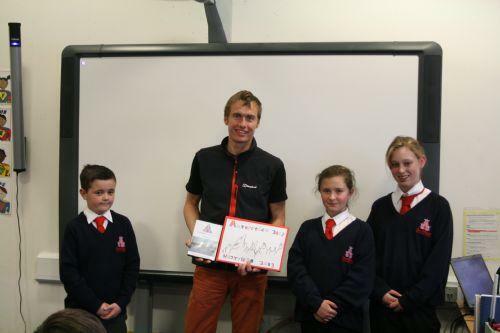 Leo was then presented with a book of the year 6 work and a full video of the ALPS expedition. "This was an incredibly successful and enjoyable afternoon, one which I am sure the children and staff will not forget" Mrs S Walton, year 6 teacher. 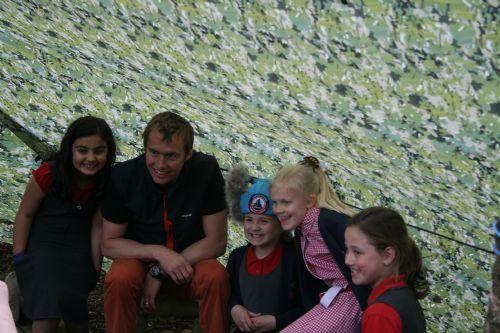 Article about Year 6's expedition, click here.